It’s a typical morning. You walk into your bathroom and commence to brush your teeth as usual, but today you notice some blood as you perform your oral hygiene routine. This is something that bothers you, so you definitely won’t just dismiss it, but you’re not sure what to do. Thankfully, your dentist in Montrose has 5 simple steps you should take to get to the bottom of the problem and restore the normal, healthy function of your mouth, teeth and gums. Continue reading to learn what these tips are and how preventive dentistry helps to promote oral health! When you notice that your gums are bleeding, it’s a sign that something is imbalanced in your mouth. 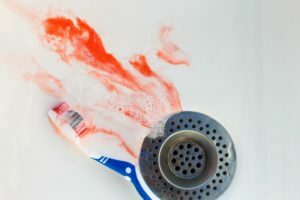 The disharmony can be the result of something minor (like improper brushing techniques) or the effect of a major problem (like gum disease) that’s developing. Improve Your Oral Hygiene – One of the first things you can do when you notice any bleeding, is to take a look at your oral hygiene. Are you brushing and flossing at least twice a day? When you brush, are you engaging for at least two minutes? If you can’t answer ‘yes’ to both questions, then you’ll know where to start in addressing your gum bleeding. Evaluate Your Oral Care Tools – Take a look at the tools you’re using to clean your teeth and gums. How long have you had your toothbrush? Has it been more that three months? If so, then it must be replaced. Another factor to consider is the softness of the bristles on your toothbrush. If they’re the firmer type, they could be contributing to your gum bleeding. Make Diet Improvements – Are you consuming an excess amount of snack foods that are processed and high in sugar? If so, then you are contributing to the growth of excess bacteria that engulf your mouth and irritate your gums. A simple remedy is to eliminate the source of the problem – processed sugars – and incorporate more healthy alternatives, like fruits and vegetables, into your diet. Consider Any Medications – Another possible factor could be a new type of medication that you’re taking. It could be causing changes to the chemistry of your body that result in increased susceptibility to gum bleeding. Visit Your Dentist – Finally, be sure to visit your dentist when you see signs of bleeding. He’ll be able to eliminate any guessing and develop a treatment protocol to get you back to normal. It’s a must that we expound on the suggestion of visiting your dentist by discussing the importance of semi-annual appointments for cleanings and checkups. These visits will spare you from a litany of problems and cut through any confusion you may have about what’s going on with your mouth. Not only will you receive thorough cleanings and examinations, but you’ll also be able to talk to your dentist about ways for you to make improvements in your oral hygiene and overall care. The process simply starts with you reaching out to your dentist today to schedule an appointment! With over 32 years of experience practicing dentistry, Dr. Donald F. Tamborello is a fixture in the Montrose community. A graduate of the University of Texas, he remains just as passionate today as he was when he first started his practice. Dr. Tamborello can be reached for more information through his website.